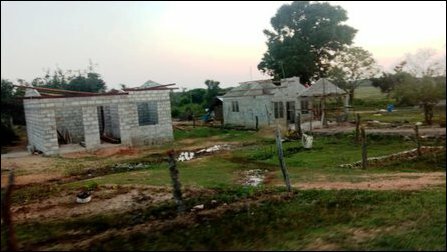 The National Housing Development Authority (NHDA), which comes under the SL Ministry of Housing and Construction, has illegally allocated a housing scheme to intruding Sinhala colonists in Pulmoaddai, Trincomalee. The colonists are backed by four Sinhala Buddhist monks and the Sinhala-only Civil Defence Force (CDF), previously known as ‘home guards’ paramilitary. 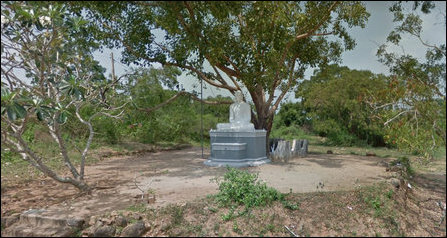 The construction is taking place at 12th Mile Post (Maalaanoor) and the 10th Mile Post (Ea'raa-madu) in Kuchchave'li division of Trincomalee district. The houses are being hurriedly constructed in the same fashion as the lands were occupied in September 2018, when the intruders put up almost 30 huts within a few days. The colonisation is going on in the lands belonging to twenty-four Tamil speaking families at Maalaanoor in addition to the properties at 10th Mile Post. Kuchchave'li Division is a Tamil-speaking division, and the Divisional Secretariat has responded to a Right to Information Act based application filed by the Muslim land-owners in Pulmoaddai. The response was confirming that the housing scheme was being put up by the NHDA without following the due procedures in alienating the lands. 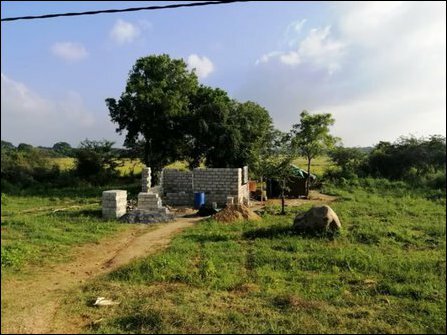 Thirty-five Sinhala colonist families in Maalaanoor (12th Mile Post) and seventeen colonists at the 10th Mile Post are going to be the beneficiaries of the houses, informed sources said. The CDF is providing security to the housing scheme both day and night. The monks are also frequently inspecting the construction. Sajith Premadasa is the SL Minister of Housing and Construction. 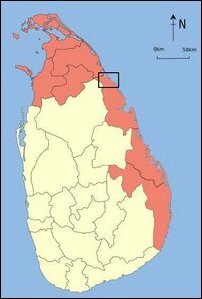 The Sinhala colonists are from outside the district. They were seen clearing the jungles at the presence of SL Forest Department guards in September 2018. The District Secretary of Trincomalee (GA) is a Sinhalese, who is backing the colonisation which is promoted by the CDF paramilitary and a Sinhala GS officer from a border area. The GS officer doesn't belong to Pulmoaddai. Maalanoor is located between the 12th Mile Post and the 13th Mile Post along Thennaimaravadi-Pulmoaddai Road. The 27th Battalion of the Gajaba Regiment of the SL Army is situated at the 13th Mile Post (22 km post) on Anuradhapura - Pulmoaddai Road. 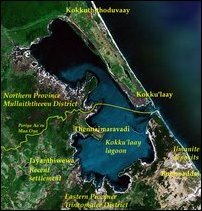 The area is also located south of Kokku'laay lagoon in the Trincomalee district. The SL military is also providing security to the settlers as well as the SL Police. The ‘Shanthipura Rajamaha Vihara’ is located between the military base and the colony. There are four monks stationed at the Vihara. They are fully involved with expanding the Sinhala colony, the civil sources in Kuchchave'li Division said. The lands belonging to Road Development Authority (RDA) and the SL Forest Department have also been absorbed into the colony as well as the deed and permit lands of private land-owners. Tamil-speaking Muslim activists in Pulmoaddai blame the Sinhala extremist monk, Panamure Thilakawansa thero, who has vowed to Sinhala-Buddhicise the Pulmoaddai area, as an active promoter of the Sinhala colony. The Muslim villagers have been confronting the monk through lawsuits as well as political pressure against the expansion of the so-called “Shanthipura Rajamaha Vihara,” which was being schemed near Maalaanoor in 2014-2015. 11.03.19 118 Muslim families demand occupying SL Navy to release thei..
06.03.19 Sinhala ‘emperor’ monk wants Muslims expelled from Arisi-mal..